It's Tuesday . . . time for . 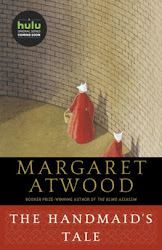 . .
First Chapter First Paragraph Tuesday Intros hosted by Diane at Bibliophile by the Sea, where bloggers post the first paragraph(s) of a book they are currently reading or planning to read sometime soon. 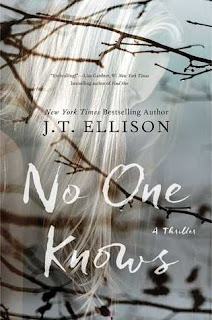 Today I'm featuring an upcoming read, No One Knows by J.T. Ellison, which I borrowed from the library. One thousand eight hundred and seventy-five days after Joshua Hamilton went missing, the State of Tennessee declared him legally dead. Aubrey, his wife--or former wife, or ex-wife, or widow, she had no idea how to refer to herself anymore--received the certified letter on a Friday. It came to the Montessori school where she taught, the very one she and Josh had attended as children. Came to her door in the middle of reading time, borne on the hands of Linda Pierce, the school's long-standing principal, who looked as if someone had died. J.T. 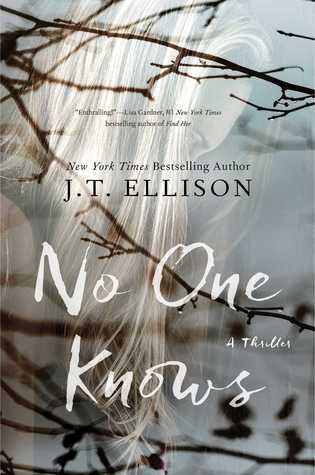 Ellison has been on my list of authors to try for a while now, so this book and this month seem like a good place to start. First Chapter ~ First Paragraph was originally published by Catherine for bookclublibrarian.com. This post cannot be republished without attribution. Retweeting and sharing on Google+ are appreciated.